Clearogen is a revolutionary new treatment for acne. Formulated by Board Certified Dermatologist Alex Khadavi MD, Clearogen will help control and treat acne by combining scientifically proven natural ingredients with an FDA approved, easy 3 step treatment to attack and both the root causes of acne as well as its symptoms. 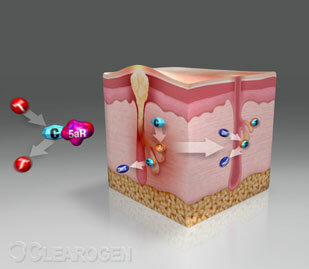 Clearogen attacks DHT (Dihydro Testosterone) the hormonal byproduct that initiates the formation of Acne. DHT stimulates the oil glands in the skin to produce excessive oil resulting in obstruction, infection, and inflammation of the skin pore that are the prime symptoms of this skin condition. Clearogen medication is a simple 3-step treatment for acne control for adults and teenagers, used once daily for striking results. CLEAROGEN Acne Treatment is the first product to combine both prescription grade ingredients and scientifically proven natural botanicals to clear acne at the first stage of formation. This easy 3 step treatment for acne attacks the root cause of acne while rejuvenating the skin. Clearogen is developed by Board Certified Dermatologists Dr. Alex Khadavi after years of research and development. As a result, Clearogen uses only the safest and most effective ingredients available and is meticulously tested to ensure optimum results. Clearogen is the only over-the-counter topical product to treat acnethat works at the root of the problem. It not only treats existing acne and prevents new lesions, but it stops the first phase of development. This is accomplished by preventing excessive oil production by the oil glands to prevent clogging of the pore and bacteria growth. 1. Clearogen Inhibits the conversion of Testosterone to DHT and reduces excessive oil production. 2. Clearogen blocks the Androgen Receptors and prevents stimulation of oil glands. 3. Clearogen opens the pores, kills the bacteria and reduces the inflammation, allowing healing and skin renewal for clear and vibrant skin. Use once daily. Thoroughly lather foam over wet skin, rinse well, and pat dry. Avoid eye area. Salicylic acid 2%. Deionized Water� Ammonium Lauryl Sulfate � Butylene Glycol � Di-PPG-2-Myreth-10 Adipate.� Polysorbate 20. Triethanolamine � Hydrolyzed Wheat Protein � Hydrolyzed Wheat Starch � Aloe (Aloe arbadensis ) Vera Gel � Rosemary Extract � Phenoxyethanol� Lavender E.O. 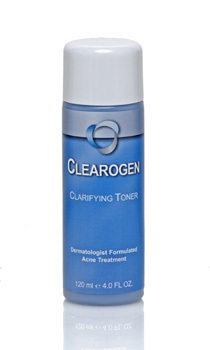 Clearogen Clarifying Skin Acne Toner eliminates pore clogging purities allowing balanced oil production, while decreasing pore size, reducing redness, and irritation. Botanical extracts increase skin renewal for silkier, smoother skin. Salicylic acid 1%. SD Alcohol 40 B . Deionized Water . Witch Hazel Distillate . Dodecyl Gallate . Propyl Gallate . Glycerin PEG-12/SMDI Copolymer . Polysorbate 20 . Comfrey Extract . Indian Plantin Extract . Wheat Hydrolysate Extract . Sodium PCA .Hydrolyzed Wheat Protein . Phenoxyethanol . Hydrolyzed Wheat Starch . Rosemary Extract . Chamomile Extract .Di-PPG-2-Myreth-10 Adipate . Allantoin . Dipotassium Glycyrrhizinate. Clearogen Acne Lotion is light weight, shine free moisturizer that protects the skin by reducing redness, irritation while clarifying the pore. Clearogen lotion clears existing acne and helps prevent future breakouts before they surface on the skin, leaving skin softer and smoother. Other acne lotions available today are designed primarily to clear the pimples with harsh lotions and creams that can cause redness or irritation. Clearogen Acne Lotion clears existing skin while preventing future breakouts by addressing the root cause of the skin condition. - Helps prevent future breakouts. Use once daily. After cleansing and toning, apply acne lotion over the entire face. Benzoyl Peroxide 2.5% . Deionized Water � Gamma Linolenic Acid, Alpha Linolenic Acid . Oleic Acid . Saw Palmetto Extract . Beta Sitosterol � Green Tea Catechin � Caprylic/capric Triglyceride � Cetearyl Alcohol . Dicetyl Phosphate � Ceteth-10 Phosphate � Dimethicone � Glycerin � Glycine Soja (Soy) Sterols � Aloe Vera Gel � Glyceryl Stearate . PEG-100 Stearate � Sodium Hyaluronate � Cetyl Alcohol � Stearic Acid � Phenoxyethanol � Mallow Peppermint Leaf, Primula, Veris extract � Imperata cylindrica Extract � Phospholipid � Comfrey Extract � Indian Plantin � Wheat Hydrolysate Extract � Triethanolamine � Tocopheryl Acetate (vitamin E) � Neem Extract � Fragrance � Chamomile Extract � Xanthan Gum � Methylparaben � Propylparaben � Sulfur � Magnesium Aluminum Silicate � Disodium EDTA � Retinoic Acid. Acne is the most common skin condition affecting everyone at some point during their life time. Affecting both sexes and all ages from the young to the elderly. acne begins weeks before blemishes become visible on the surface of the skin, and starts within the oil producing glands. Normally these glands produce adequate amounts of oils that keep our skin healthy, shiny and young. In the presence of a body hormone known as DHT (Dihydro Testosterone), however, these glands produce excessive amounts of oil resulting in the formation of acne. Acne begins with the negative effects of DHT (Dihydro Testosterone) on the oil glands. 1. The Enzyme 5 Alpha Reductase converts Testosterone to DHT . 2. DHT binds to Androgen Receptors on the oil glands. 3. DHT stimulation results in excessive oil production. 4. Excess oil obstructs the skin pores allowing bacterial growth that causes inflammation, infection and visible acne. Acne is a skin condition that shows up in different ways. Blemishes can include white-heads, blackheads, red bumps (pimples), and bumps that are filled with pus or cysts. What causes these annoying conditions? Skin is covered with tiny holes called pores. Pores contain sebaceous glands (also called oil glands) that make sebum (see-bum), an oil that moistens hair and skin. Excessive oil production forms a plug called a comedone or whitehead at the opening of the pore. It fits like a cork in a bottle. This plug holds the oil and bacteria inside the oil gland which begins to swell as the skin produces more oil and bacteria. White blood cells swarm around the oil gland to kill the bacteria. The result is a pimple or pustule. If a pore gets clogged, closes and bulges out from the skin, it is called a whitehead. If a pore clogs up but stays open, the top surface can get dark and produces a blackhead. This is not dirt and won't wash away. The color is due to an oxidation of the plug contents. Sometimes the walls of the pore are actually broken down, allowing sebum, bacteria, and dead skin cells to multiply resulting in a small, red infection called a pimple. Most people have non-inflammatory acne, a relatively mild form with just a few whiteheads and blackheads. 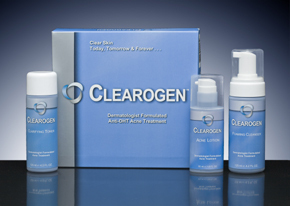 Non-inflammatory acne can be treated very effectively with Clearogen. For those experiencing inflammatory acne, whiteheads become infected with bacteria and swell, producing pimples and pustules. Inflammatory acne can also be treated with Clearogen. Severe inflammatory acne, however, can cause disfiguring cysts and deep scars and needs to be under a dermatologist's care who may initially use prescription drugs like oral antibiotics or Accutane as well as laser treatments. Once the deep cystic lesions have been treated Clearogen Acne Products can be used to prevent future breakouts thereafter. The chance of developing acne is affected by many factors. Most importantly, the rate the skin produces oil as determined by the DHT levels, plays a critical role. Because genetics strongly influence the development and persistence of acne, one's family history is important. If ones parents had severe acne, one's acne is more likely to be severe too. Acne can change one's social life, confidence level, school and job opportunities and even lead to personality disorders. These real life situations, which are traumatic for teenagers and adults to who live with this condition. Acne affects people of all ages and teenagers seem to have the biggest challenges due to hormone changes. Parents can help teenagers by educating themselves about acne and the best methods for treating acne. Skin problems are truly more than skin deep. About 90% of all teenagers develop acne at or about the time of puberty when hormonal levels change. During puberty that can start from the age of 12 the hormone levels began to change in the body. Teenage acne is directly tied to Testosterone - one of the key hormones that is involved in adolescent puberty in both sexes. The imbalance of Testosterone levels in adolescence results in high levels of DHT production that in turn leads to excessive oil production within the skin and leads to teenage acne. This is the first and the key step in formation of Acne in teenagers which is not addressed by other treatments in the market. Instead they focus on treating the symptoms of skin acne that are the visible lesions. Clearogen is the first product that addresses the root cause of both adult and teenage acne by reducing DHT production - preventing future breakouts as well as the acne lesions. To avoid the risk of permanent scars, it's important to treat teenage acne as soon as the first signs appear. Clearogen is safe and effective for everyone, and it can help prevent skin blemishes from becoming a larger problem. For an adult, conditions may also start as late as the 20's or 30's, especially in women whose hormones are constantly fluctuating. This is referred to as adult acne, affecting nearly half of all adult women whom develop mild to moderate conditions and ten percent of adult males. Adult acne in women is more prominent due to the unbalanced hormone production during the menstrual cycle. In adults acne lesions typically develop before, after or during the menstruation, resulting in nagging, painful bumps under the skin, usually along the jaw-line, chin or cheeks. Clearogen Acne Product works to control the hormone production within the skin preventing the unwanted high levels of the hormone DHT that results in these lesions. For male adult acne, Testosterone is the dominant hormone which is then converted to DHT resulting in prominent lesions throughout the skin. Clearogen acne treatment and medication controls levels of DHT in the skin clearing the existing skin and preventing acne lesions at the first stage. 1) Is Acne caused by dirt or un-cleanliness? 2) Can blackheads result in scarring? 3) Will Clearogen products help the pimples on my body? 4) What is DHT and why does it the cause of acne? DHT or Dihydrotestosterone is a hormone by-product produced by both males and females particularly during puberty. As the levels of DHT increase, the oil glands become overly stimulated and result in overproduction of oil. This excessive oil accumulates in the pores and clogs the pores, resulting in acne. Clearogen is the only product to address the excessive DHT with natural botanicals that work to dramatically reduce DHT resulting in normal oil production and oil flow. As such acne can be prevented at the first step. 5) Is squeezing a pimple bad? Yes. Squeezing or popping pimples spreads bacteria and ultimately results in scars. Popping a pimple could actually make the pimple last longer b/c the skin ends up red and irritated for a longer period. 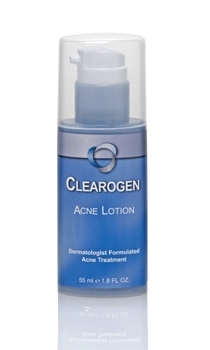 By using Clearogen's acne toner you can help dry the pimple faster with out leaving scars or redness and irritation. 6) Do I need to use Acne spot treatments? No. The key to acne treatment is PREVENTION . By using the 3 step Clearogen Acne treatment all over your face you can prevent breakouts before they develop while treating the existing acne lesions. 7) Does makeup cause Acne? Yes. Pore clogging make up or oil-based cosmetics can result or worsen acne. It is wise to always buy makeup that is noncomedogenic; meaning that it won't clog your pores. 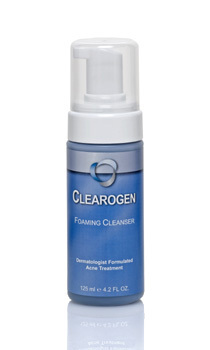 Using Clearogen foaming skin cleanser, you can gently remove make up while treating your acne. Alex Khadavi, MD; board certified Dermatologist, is the founder and CEO of Advanced Skin and Hair, Inc. and formulator of Clearogen, the first Anti-DHT Product for Acne and Revivogen Anti-DHT solution for treatment of hair loss. Dr. Khadavi studied medicine at George Washington University School of Medicine in Washington, DC and completed his dermatology training at University of California, San Francisco. During his training Dr. Khadavi learned about DHT, a testosterone by-product that is the underlying cause of many skin conditions including Acne and Hair Loss. After years of extensive research and experience as a dermatologist, he learned about natural ingredients that can reduce production of DHT effectively and without side effects. He used this knowledge to formulate Revivogen and now Clearogen, the first Anti-DHT Acne Treatment of its kind. George Washington University, School of Medicine, Washington, D.C. The Anti-DHT ingredients in Clearogen are natural compounds proven to inhibit 5-Alpha-Reductase (the enzyme that produces DHT), and block the androgen receptors. These active ingredients include Gamma Linolenic acid (GLA), Alpha Linolenic acid (ALA), Linoleic Acid, Oleic Acid, Saw Palmetto Extract, Beta-Sitosterol, Green Tea Catechins, Dodecyl Gallate, and Octyl Gallate. Clearogen is the only product that contains these ingredients in one easy to use topical formula. In the following studies, Gamma Linolenic Acid (GLA), Alpha Linolenic Acid (ALA), and Linoleic Acid were shown to be the most potent known inhibitors of type 1 and 2 forms of 5-alpha reductase and highly effective in decreasing the levels of dihydrotestosterone (DHT), when applied topically. More importantly this is accomplished without affecting any systemic effects. The study further suggests that these fatty acids can be useful in the treatment of disorders related to dihydrotestosterone including male pattern baldness, acne, and excessive female body hair (hirsuitism). Androgen action in many organs, such as prostate and skin, is dependent on the conversion of testosterone by 5 alpha-reductase to 5 alpha-dihydrotestosterone. 5 alpha-Dihydrotestosterone then binds to the androgen receptor to regulate specific gene expression. Inhibitors of 5 alpha-reductase are useful for the selective treatment of prostatic cancer, benign prostate hyperplasia, acne, baldness and female hirsuitism, without affecting spermatogenesis, sexual behavior and smooth muscle growth, that do not require the conversion of testosterone to 5 alpha-dihydrotestosterone. Certain unsaturated fatty acids, such as gamma-linolenic acid, are potent 5 alpha-reductase inhibitors, suggesting a linkage between unsaturated fatty acids and androgen action. Mutations in androgen receptor genes are responsible for many cases of androgen-insensitivity. In some prostate cancer cells, some antiandrogens may act like androgens in stimulating the proliferation of the cancer cells because these antiandrogens can bind to a mutated androgen receptor and transactivate target genes. Prostate cancers are usually androgen-dependent initially but can lose dependency and responsiveness. Tumor cells which are resistant to endocrine therapy ultimately proliferate. Androgen-independent or androgen-repressive cells can arise from androgen-sensitive prostate cancer cells by changes in specific gene expression over time in a clonal isolate. This change in androgen responsiveness was accompanied by a change in androgen receptor expression and transcriptional activity as well as expression of some oncogenes. Human or rat microsomal 5 alpha-reductase activity, as measured by enzymatic conversion of testosterone into 5 alpha-dihydrotestosterone or by binding of a competitive inhibitor, [3H]17 beta-NN-diethulcarbamoyl-4-methyl-4-aza-5 alpha-androstan-3-one ([3H]4-MA) to the reductase, is inhibited by low concentrations (less than 10 microM) of certain polyunsaturated fatty acids. The relative inhibitory potencies of unsaturated fatty acids are, in decreasing order: gamma-linolenic acid greater than cis-4,7,10,13,16,19-docosahexaenoic acid = cis-6,9,12,15-octatetraenoic acid = arachidonic acid = alpha-linolenic acid greater than linoleic acid greater than palmitoleic acid greater than oleic acid greater than myristoleic acid. Other unsaturated fatty acids such as undecylenic acid, erucic acid and nervonic acid, are inactive. The methyl esters and alcohol analogues of these compounds, glycerols, phospholipids, saturated fatty acids, retinoids and carotenes were inactive even at 0.2 mM. The results of the binding assay and the enzymatic assay correlated well except for elaidic acid and linolelaidic acid, the trans isomers of oleic acid and linoleic acid respectively, which were much less active than their cis isomers in the binding assay but were as potent in the enzymatic assay. gamma-Linolenic acid had no effect on the activities of two other rat liver microsomal enzymes: NADH:menadione reductase and glucuronosyl transferase. gamma-Linolenic acid, the most potent inhibitor tested, decreased the Vmax. and increased Km values of substrates, NADPH and testosterone, and promoted dissociation of [3H]4-MA from the microsomal reductase. gamma-Linolenic acid, but not the corresponding saturated fatty acid (stearic acid), inhibited the 5 alpha-reductase activity, but not the 17 beta-dehydrogenase activity, of human prostate cancer cells in culture. These results suggest that unsaturated fatty acids may play an important role in regulating androgen action in target cells. Study A: Human prostatic steroid 5 alpha-reductase isoforms--a comparative study of selective inhibitors. Study B: Testosterone metabolism in primary cultures of human prostate epithelial cells and fibroblasts. Study C: The effect of Permixon on androgen receptors. Permixon, the liposterolic extract of the plant Serenoa Repens is a recently introduced drug for the treatment of benign prostatic hyperplasia. The effect of Permixon on dihydrotestosterone and testosterone binding by eleven different tissue specimens was tested. The drug reduced the mean uptake of both hormones by 40.9% and 41.9% respectively in all tissue specimens. Since hirsutism and virilism are among other gynecological problems caused either by excessive androgen stimulation or excess endorgan response, we suggest that Permixon could be a useful treatment in such conditions and recommend further investigations of the possible therapeutic values of the drug in gynecological practice. This article refers to the activity of multiple natural ingredients that have the potential for inhibition of 5-alpha-reductase activity. Of the ingredients in the article, dodecyl gallate has the greatest inhibition of 5-alpha-reductase activity in both cell-free and whole cell assays in vitro. The significance of this is that dodecyl gallate inhibits both forms of 5-alpha-reductase (type I and type II) in not only the presence of the enzyme but can penetrate the cell membrane and inhibit the enzyme while the cells are in culture, further supporting the effectiveness of dodecyl gallate. Biochem Pharmacol. 2002 Mar 15;63(6):1165-76. Structure-activity relationships for inhibuman 5alpha-reductases by polyphenols. The articles below demonstrate the antibacterial effect of Dodecyl Gallate. The high antibacterial effect of Dodecyl Gallate promotes decreased inflammation in acne prone skin since the reduced level of bacteria allows healing process to occur without inflammatory by-products of bacteria. Bioorg Med Chem. 2003 Sep 15;11(19):4255-62. Molecular design of multifunctional antibacterial agents against methicillin resistant Staphylococcus aureus (MRSA). Antibacterial activity of a series of alkyl gallates (3,4,5-trihydroxybenzoates) against Gram-positive bacteria, especially methicillin resistant Staphylococcus aureus (MRSA) strains was evaluated. Gram-positive bacteria are all susceptible to alkyl gallates. Dodecyl gallate was the most effective against MRSA ATCC 33591 strain with the minimum bactericidal concentration (MBC) of 25 microg/mL (74 microM). The time-kill curve study showed that dodecyl gallate was bactericidal against this MRSA strain at any growth stage. This activity was observed even in the chloramphenicol-treated cells, but the rate of decrease of cell number was slower than that in the exponentially growing cells. The bactericidal activity of medium-chain alkyl gallates was noted in combination with their ability to disrupt the native membrane-associated function nonspecifically as surface-active agents (surfactants) and to inhibit the respiratory electron transport. Subsequently, the same series of alkyl protocatechuates (3,4-dihydroxybenzoates) were studied and the results obtained are similar to those found for alkyl gallates. The length of the alkyl chain is not a major contributor but is related to the activity. Bioorg Med Chem. 2003 Feb 20;11(4):573-80. Non-antibiotic antibacterial activity of dodecyl gallate. Dodecyl (C(12)) gallate (3,4,5-trihydroxybenzoate) (1) was found to possess antibacterial activity specifically against Gram-positive bacteria, in addition to its potent antioxidant activity. The time-kill curve study indicates that this amphipathic gallate exhibits bactericidal activity against methicillin resistant Staphylococcus aureus (MRSA) strains. Dodecyl (lauryl) gallate inhibited oxygen consumption in whole cells and oxidation of NADH in membrane preparation. The antibacterial activity of this gallate comes in part from its ability to inhibit the membrane respiratory chain. As far as alkyl gallates are concerned, their antimicrobial spectra and potency depend in part on the hydrophobic portion of the molecule. Bioorg Med Chem Lett. 2002 Jan 21;12(2):113-6. Anti-MRSA activity of alkyl gallates. A series of alkyl gallates (3,4,5-trihydroxybenzoates) was found to show antibacterial activity against Gram-positive bacteria including methicillin resistant Staphylococcus aureus (MRSA) strains. For example, dodecyl (C(12)) gallate (1) exhibited bactericidal activity against MRSA ATCC 33591 strain with the minimum bactericidal concentration (MBC) of 25 microg/mL (74 microM). The time-kill curve study showed that dodecyl gallate is bactericidal against this MRSA strain. This bactericidal activity comes in part from its ability to inhibit respiratory electron transport systems. The length of the alkyl chain is not a major contributor but plays an important role in eliciting the activity. This article demonstrates that dodecyl gallate is a powerful antioxidant. The antioxidant effect of dodecyl gallate allows healing of acne-prone skin without inflammation from oxidative radicals of bacteria or the immune system. This reduces the oxidative stress on human skin while making the skin more vibrant and less irritated. J Agric Food Chem. 2002 Jun 5;50(12):3533-9. Dodecyl (C12) gallate exhibits both potent chain-breaking and preventive antioxidant activity. The pyrogallol moiety is responsible for both activities. Dodecyl (lauryl) gallate prevents generation of superoxide radicals by xanthine oxidase, and this activity comes from its ability to inhibit the enzyme. The inhibition kinetics analyzed by Lineweaver-Burk plots found that dodecylgallate is a noncompetitive inhibitor for the generation of superoxide anion. Dodecyl gallate also inhibits formation of uric acid. The inhibition kinetics analyzed by Lineweaver-Burk plots found that dodecyl gallate is a competitive inhibitor for this oxidation. Mitochondrial lipid peroxidation induced by Fe(III)-adenosine 5'-diphosphate/reduced nicotinamide adenine dinucleotide was inhibited by dodecyl gallate while its parent compound, gallic acid, did not show this inhibitory activity. Dodecyl gallate protected mitochondrial functions and human red blood cells against oxidative stresses, but gallic acid showed little effect. The hydrophobic dodecyl group is largely associated with the preventive antioxidative activity.